The arch of Septimus Severus in the Roman Forum was documented using scaled maps to make logical clusters of the numerous features noted on the surfaces. This is the map of the superficial deterioration mechanisms (1980). The discipline of archaeological conservation has developed in recent decades as the fruit of a lively debate and continuous and meaningful experiences. Although daily reality seems to contradict the statement above—given that most sites suffer from neglect, deterioration, poor or absent management, misguided treatments, vandalism, abuse and abandonment—we can still claim that conservation has made great strides forward; it has become ever more a part of archaeology and works in tandem with it. Nowadays, there are many tools available for conservation and many examples in the field that reflect this process of evolution and partnership between archaeology and conservation: documentation and study of monuments as a source of inspiration for conservation practices, preventive conservation to multiply the effectiveness of treatments, training as a cultural and economic investment, and public outreach as a way to spread the cultural message. And there are numerous cases where these themes were the main inspiration for treatments in the archaeological field. We will look at some of these here, studying the results of conservation treatments performed by the Center for Archaeological Conservation (CCA), Rome, in various Mediterranean countries on sites and monuments, and in museum collections (www.ccaroma.org). We will not follow a chronological or geographic order, but focus on the themes highlighted above. 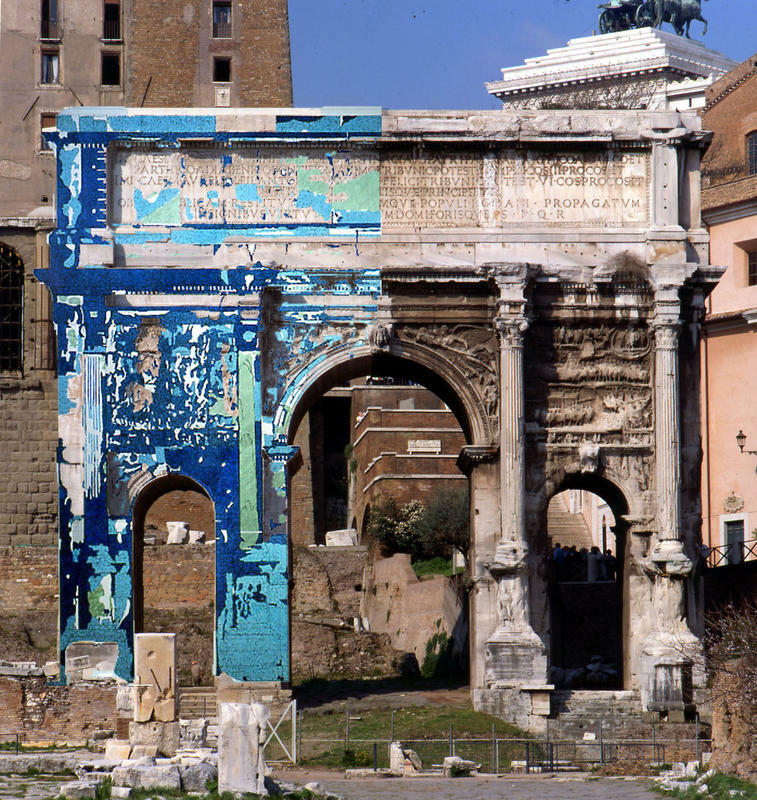 In 1980, the arch of Septimus Severus in the Roman Forum was covered with scaffolding following the fall of original material because of marble decay in the polluted urban environment. It is worth mentioning that the practice at the time was to clean a monument’s surface by removing everything that “covered” the white marble, and the stone was consolidated with synthetic resins to the point of “transforming” the original material from something weak and fragile into something else, solid and “eternal.” Documentation hardly existed: perhaps a few before-and-after photos at best. In the case of the arch, the conservators felt general consternation at the complexity of the work, the enormity of the surfaces, which were subdivided into eleven scaffold levels that impeded an overall view, the crumbling marble on the verge of dropping, the cornices with missing parts, and—to our great surprise—monochromatic layers that covered the surfaces and had been interpreted as dirt deposits. These factors led to a general rethinking and change in strategy. No direct action on the stone surface would be undertaken until we had identified a means to verify the condition of the surface and understand the decay mechanisms and the relationships between the various agents. The idea was to design a work program that, starting with direct treatment of the marble combined with structural interventions, would lead to the removal of local causes of deterioration. The objective was to return a stabilized monument to the public. Parallel to this was a plan to reorganize the city traffic and improve the environment. The problem was resolved thanks to the use of typical archaeological techniques: graphic surveys in 1:20 and 1:5 scale and technical analysis of the surface. Once the monument had been drawn by hand, the vertical stratigraphy was studied and thematic maps were produced to make logical clusters of the numerous features noted on the surfaces. First steps were also made in the use of computer graphics, a field that looked promising but was still young. Apart from giving us a topographical record of all the treatments we performed during the conservation intervention, the archaeological surveys and maps immediately made the monument’s vast size more manageable and allowed us to identify some connections between the decay and the condition of the monument. For example, the missing cornices changed the original rainwater disposal system and this could be linked to the type of decay of the surfaces below. This observation had an immediate impact on planning for the restoration of the top part of the arch. The arch of Septimus Severus in the Roman Forum reminded us of the modifications and structural integrations done at the Temple of Vespasian. Perhaps the most significant factor in understanding the monument and making operational decisions was documentation of the so-called “scialbature.” These are layers of calcium oxalate found beneath the black crusts of deterioration. They are a micron thick, monochromatic, and range in color from light beige to brown or red ocher. One can find stratified signs on them that speak of ancient maintenance, usage, illustrious visitors, burial, and abandonment. This is the monument’s historical stratigraphy. In earlier years, these layers were considered to be dirt and thus were sandblasted and removed. To us, they not only revealed a fascinating part of the history of the building, but also gave us fundamental indications on the ancient practice for maintaining monuments and the use of lime as the basic material for the current restorations. Starting from these observations, we could develop and reintroduce the use of lime for mixing mortars and stuccoes for repairs, consolidation, surface protection, and maintenance. Other cases in which the use of documentation and study of ancient techniques played a fundamental role in the conservation approach and study of the buildings were Zeugma in Turkey (2000–2004), Saint Catherine’s in the Sinai (2006–2010), and Monteprama in Sardinia, Italy. The Zeugma conservation program, ZAP2000, was implemented thanks to funding by the Packard Humanities Institute (PHI) in California. 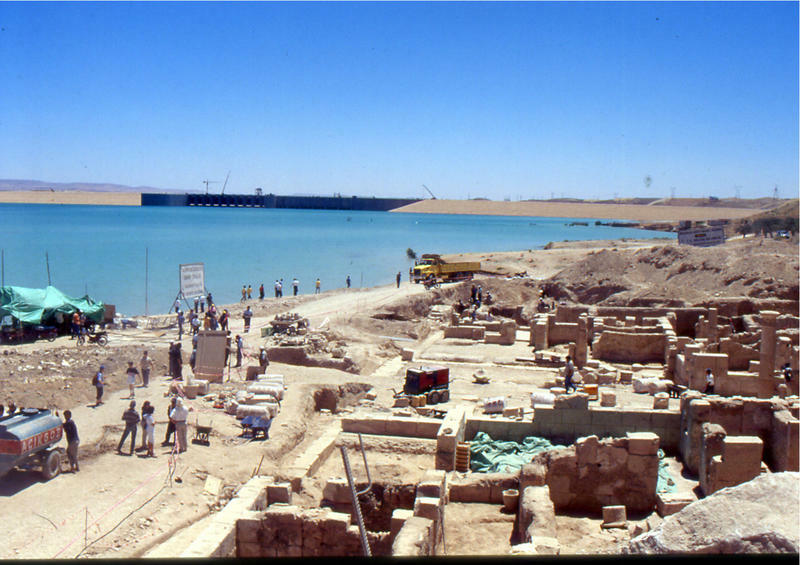 In 2000 a dike was built on the Euphrates River causing the formation of a lake at Zeugma that submerged some 30 percent of the Roman city. Before this happened—and before the phenomenon came under the control of the ZAP2000 project—the site had been the object of archaeological investigations that led to systematic detachment of all the mosaics. There was no selection, no professional conservators, and no documentation. The result was a heap of mosaics cut into pieces, glued to canvas or on cement, piled haphazardly outdoors in a museum garden or in storage, without properexcavation references or numbering. The ZAP2000 Project implemented new conservation treatment begun in 2000; piece by piece documentation permitted us to recompose the pavements individually and continue on to restoration. This operation, which lasted three years, produced 50 pavements, equivalent to more than 1,000 square meters; among which are some figured polychrome mosaics that now are part of the extraordinary collection of Turkey’s Gaziantep Museum. From a technical conservation standpoint, study of the original mortars gave us the information needed to reproduce new setting beds for the tiles. The conservators produced these new beds based on original techniques with the conviction that only such an approach could give the mosaic some of the stability it had lost when detached from its original location. 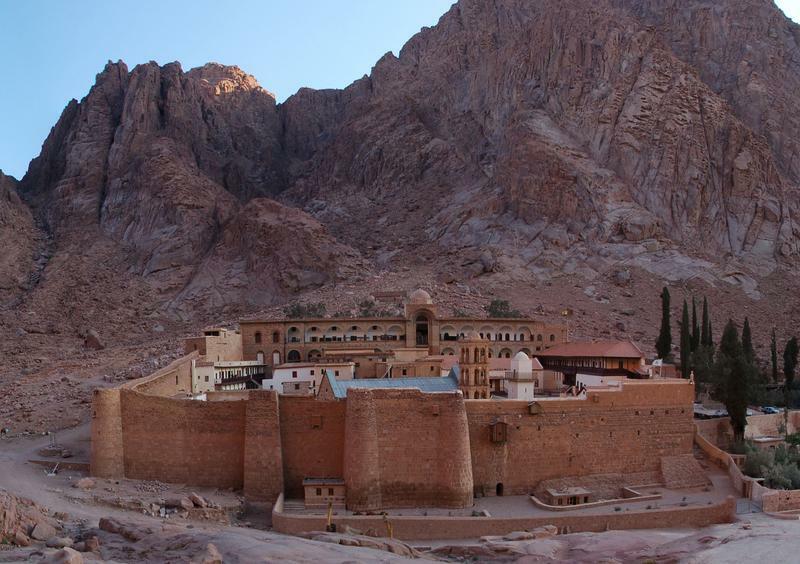 To document the conservation treatment of the mosaic of the Monastery of St. Catherine’s in the Sinai, we relied on high-resolution digital photography and image-processing software that can now be used even on scaffolding. A system was developed to record and manage the data at a scale of 1:1. Given this facility we could highlight and characterize every single tile without losing sight of the overall picture (for example, in places where one tile was missing or had been replaced). Conservation of the mosaic was made possibile thanks to funding by the Emir of Qatar, Sheik Hamad bin Khalifa Al Thani, and the Getty Foundation. Among other things, this option allowed us to adopt a solution for integrating the mosaic that we would have hotly contested only a few years ago: the use of new tiles to fill the gaps. Study of the mosaic’s working techniques had supplied—again in this case—the indications for identifying the materials and proportions to use to consolidate the crumbling and detached preparatory layers. Yet even in this case there were interesting surprises, such as the use of color to prepare the underlying drawing. The paint, showing through interstices between the tiles, fills and completes the chromatic effect of the mosaic and intensifies the transmission of light by the glass and gold tiles. 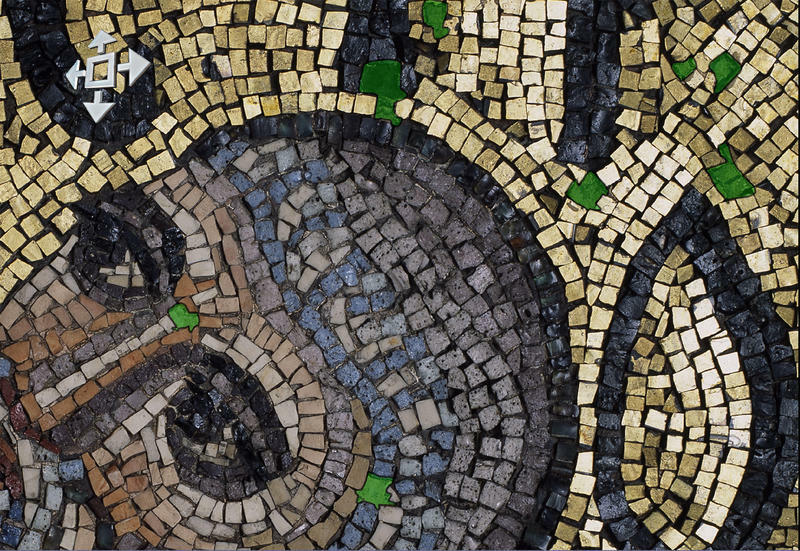 A treatment aimed at conserving the mosaic’s iconographic message, luminosity, and theological function could not ignore these important aspects of the original working technique. Indeed, it was inspired by them. One last example of documentation in the interrelationship between conservation and archaeology is that of the nuragic statues of Monteprama (ninth–eighth century B.C.). The Nuragic civilization of Sardinia’s name is derived from the name given to the thousands of stone monuments they built across the island—nuraghe. The stone nuragic statues at Monteprama were broken into 5,000 pieces, destroyed at an unknown time and found in the 1970s at Cabras, in Sardinia. 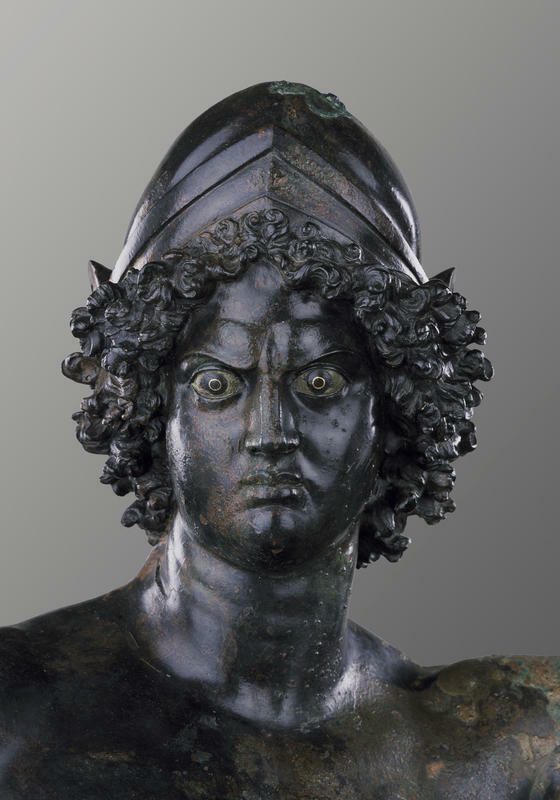 After 35 years of oblivion, thanks to detailed documentation, study of excavation records, and three long years of work by the conservators, 28 two-meter-high warriors and 10 models of nuraghe have emerged from mystery and recount a new chapter of Mediterranean history. The conservation project at Monteprama took place under the authority of the Italian Ministry of Cultural Heritage and Activities and the Superintendence for the Archaeological Heritage of Sardinia. The second theme that has gained credence in our profession is preventive conservation. It represents the most efficient tool for exploiting the slender resources that public administrations devote to archaeological heritage. By limiting risks, preventing damage, and amplifying the scale of treatments, the positive effects of the resources invested are multiplied. Planning, protection, and maintenance become formidable tools for sane and efficient management of archaeological sites. For example, in planning a new archaeological excavation while already thinking of the site’s post-excavation destiny, one might look at the global cultural project and not simply at the seasonal excavation program. This would help to prevent damage, reduce expenses, obtain scientific results, and provide a higher quality result. Here again, we will cite the case of Zeugma : in June 2000, when site management passed to the ZAP2000 project, the major change was the introduction of a strategy; we thereby had a plan that followed certain precise methodological lines (designed with David Packard and Richard Hodges, and approved by the Minister of Culture of Turkey). First among these was to plan the archaeological investigation using the entire area expected to be submerged as reference scale and the level of the water’s rise as the timeline (implemented by the Museum of Gaziantep and Oxford Unit). Second was to affirm that conservation in situ was the optimum choice for maintaining the archaeological structures. 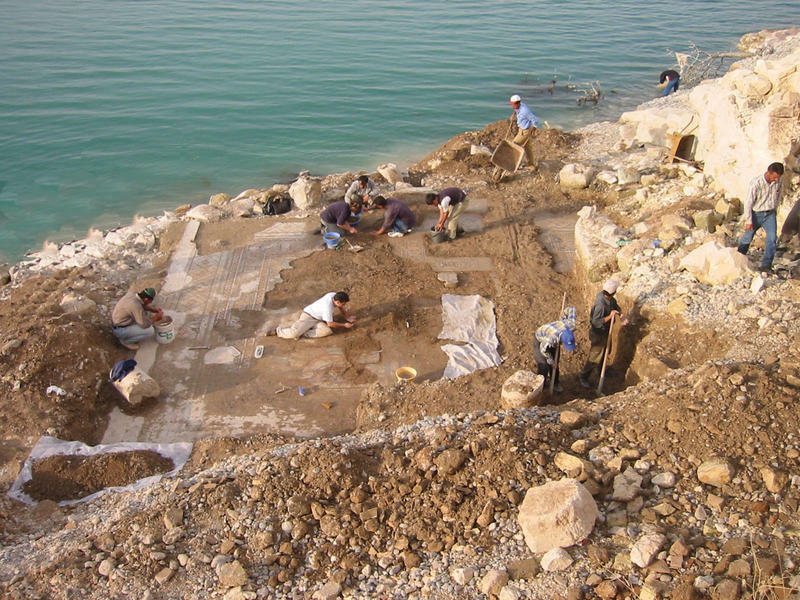 We introduced, on the one hand, a criterion for choosing what to remove and what to leave (naturally all the movable objects and a selection of facings to be detached), and, on the other hand, we organized large-scale operations of consolidation and protection for sending the site under water with the least damage to the archaeological structures. Continuing with references to preventive conservation treatments, we can cite the case of the plans for conservation and maintenance of the sites of Nora in Sardinia (2003), Ostia Antica near Rome, and Zippori (1994–1995) and Masada (1995–1996) in Israel. The first two projects were under the auspices of the Italian Ministry of Cultural Heritage and Activities, the latter two fall under the National Parks Authority of Israel. In the first example, to implement a conservation plan, the site was classified into three areas with different levels of public exposure; the type and cost of curative treatments and maintenance were worked out; and a maintenance schedule was supplied with a list of tasks to be performed regularly. In the other examples, the pavements were consolidated in situ with lime-based techniques, systems for seasonal protection were tested and produced using prefabricated “cushions” of geofabric and expanded clay pellets, large-scale cleaning techniques were developed, and visitation routes were reorganized. In every case, maintenance plans were drafted and administrators were given the instructions needed to apply the plans. Last, we cite the case of a museum, the Capitoline in Rome (1990–2001). At the end of the conservation/restoration treatment of the building and the Roman statuary collection, a maintenance plan for the structures and sculpture was provided. For this project, Andreina Costanzi Cobau, responsible for CCA of “Open for Restoration” received the IIC Keck Award in Bilbao on 2004. If we want archaeological conservation to continue in this positive vein, we need resources, human and economic. Or rather, we need to explain how conservation is doubly advantageous from an economic standpoint. Preventive conservation both foresees and limits damage and thereby cuts costs. It also lends itself to highly attractive initiatives (e.g., cultural tourism), which can generate wealth and employment. The human resources we need are trained conservators. To achieve this we must link local field opportunities with parallel academic institutional programs. Israel provides one example in the aforementioned sites of Zippori and Masada. From 1990 to 1998, during the CCA’s conservation projects in Israel, technicians were included in the company’s organizational chart, to be trained while work proceeded. Parallel to this, as part of an integration program for new immigrants, small groups of maintenance technicians were also trained. This project evolved with Architect Giora Solar, director of the Conservation Department of the Antiquities Authority of Israel, who observed the CCA engaged from 1990 to 1998 in Jerusalem, Cesarea, Zippori, Masada, Mamshit, in training some 30 technicians who were subsequently employed by the National Parks Authority as field conservators. In the case of Piazzale delle Corporazioni at Ostia, a group of employees of the Tunisian Institution of National Patrimony (INP) were trained in maintenance and conservation of outdoor mosaics. 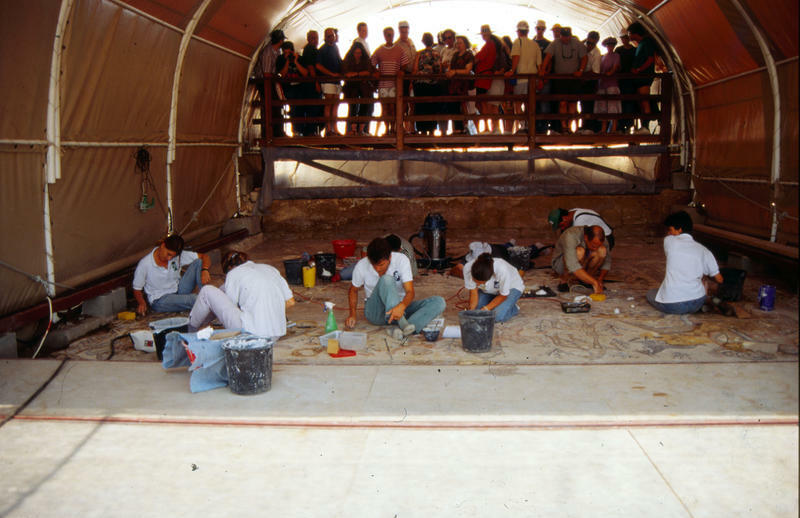 The project at Ostia was part of a training program on the conservation of mosaics in situ organized in 1998 by the Getty Conservation Institute (GCI) in Tunisia in collaboration with the INP. 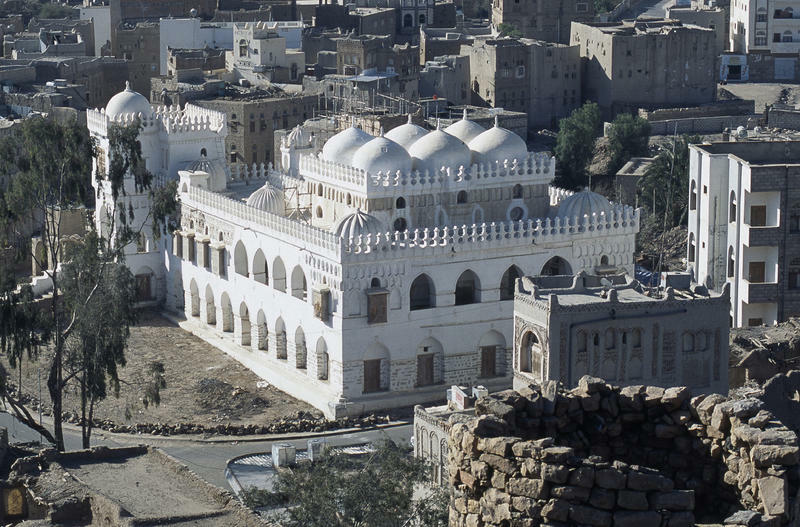 There is also the case of the Amiriya Madrasa in Yemen (2003–2005). There, the conservation project, funded by the governments of Yemen and the Netherlands,was the occasion for training a group of six local operators from the Yemeni General Organization for Antiquities, Museums, and Manuscripts. Following the training course, they would take up responsibility for maintaining the monument. 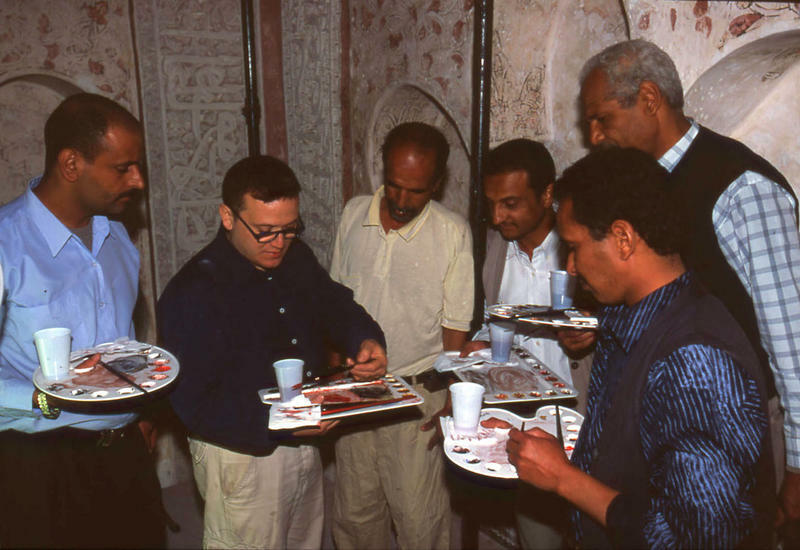 The training course in wall painting conservation was funded by the Italian Ministry of Foreign Affairs and in 2007, Selma Al Radi, director of the Amiriya Madrasa Conservation Project received the Aga Khan Award for Architecture. Training in curative and preventive conservation is a universal need. 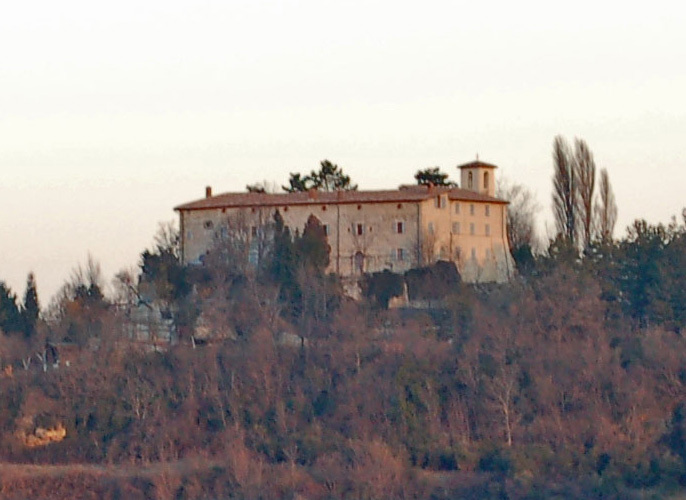 We know this from the large number of requests the CCA receives in the course of our projects—to the point that we decided to get a place to hold training activities: the convent of San Nicola, north of Rome. After lengthy restoration work, the convent has become the headquarters of our organization and the location of training courses. As to the sustainability of conservation projects, we return to the case of the Amiriya Madrasa in Yemen. Thanks to the recovered splendor of the restored Madrasa and its opening to the public, the small and remote town of Rada’a has become part of a tourist circuit, attracting a small number of intrepid visitors every day. This brings a modest revenue to the town, in a location that had formerly been completely unknown. The conservation program’s other objective, besides training a local team for maintenance, was the publication of richly illustrated volumes on the monument in three languages and the printing of 15,000 postcards to be sold on site to generate income to support the maintenance team. The aforementioned treatment of the mosaic in the Monastery of St. Catherine’s in the Sinai provides yet another example of activities carried out on the sidelines of a conservation program in order to raise funds for a monument’s maintenance. There, 40,000 booklets in eight different languages were produced to illustrate the conservation project. The monastery sells them to pilgrims and visitors. Circulating the results of studies and public outreach have also become common practice in conservation. Our mission is to preserve and enhance archaeological heritage and the cultural message it brings us from the past. Facilitating and spreading that information is our duty. The first time the CCA opened a conservation worksite to the public was in 1985 with the Arch of Septimus Severus in the Roman Forum. Since then, almost all of our projects have included activities to facilitate public access to our work and we are strongly convinced of the validity and merit of this choice. 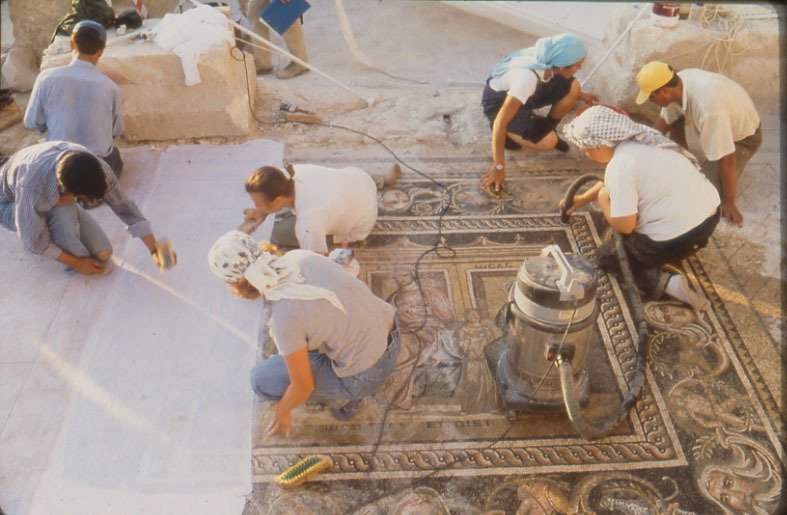 Two further examples are the conservation of the house of the Nile mosaic in Zippori and the Large Baths of Herod’s Northern Palace at Masada (1996). At Masada, more than half a million visitors were able to see the monument, watch the conservation work in progress, and appreciate the efforts the National Parks Authority was making to preserve a site of key importance in Israel. 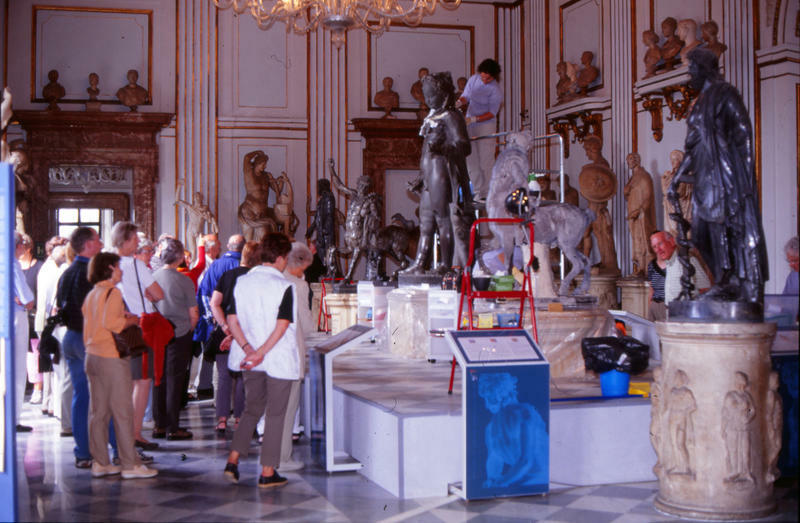 Similarly, in the case of the Capitoline Museum, during conservation of the building and the Roman sculpture collection (including the Centaurs from Hadrian’s Villa), the public not only could observe the work through our “Open for Restoration” initiative, but could also take part in a series of programs organized for schools, senior citizens, and the visually challenged. This initiative attracted droves of visitors and ended with a ceremony in the town hall with the mayor of Rome. 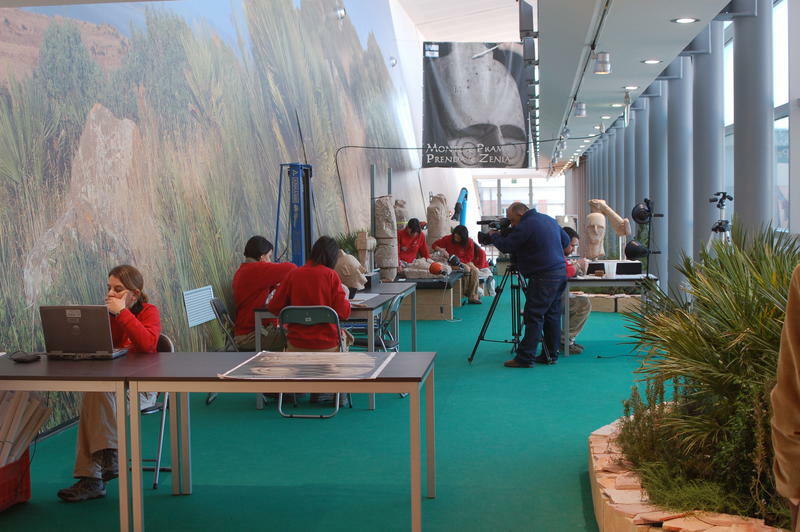 Another case of public outreach is that of the conservation and restoration of the nuragic statues of Monteprama, in Sardinia. There, the worksite was planned bearing in mind the need to give maximum emphasis to public information: a special laboratory was designed for visitor circulation and information exchange. For the first time, a professional press agent joined the staff of conservators. Direct contact with visitors was established through a web page and many visitors returned frequently (www.monteprama.it). Among other things, the page allowed us to follow public opinion regarding the conservation program. This press operation proved to be a great success: not only did it reverse the hostile attitude of the local population, which was highly annoyed with the public administration for the 30-year delay in beginning the conservation work, but it also helped to create solidarity among archaeologists, conservators, and citizens who sought to enhance and publicize the cultural phenomenon that these statues represent for Sardinia. To conclude this long review of activities implemented in the field of conservation in archaeology, one final consideration is necessary. Up until a few years ago, the cause of deterioration of archaeological sites was attributed to lack of funds and inadequate conservation techniques. Nowadays, we know this is no longer true because, as we have seen, funds and conservation techniques both exist, even though a general state of decay persists in the majority of archaeological sites. Regarding funds, the problem is the way they are spent and the poor quality of planning and management. As for conservation techniques, the problem is information, training, and accessibility. The techniques exist, but not everyone is familiar with them, capable of applying them, or has access to them. This is the direction our commitment as conservators should lead us: develop programs that diffuse information, dedicate resources and availability to training, simplify, and make conservation programs ever more accessible and exportable—so that everyone can enjoy the benefits of the formidable instrument of conservation in archaeology. Roberto Nardi received a degree in archaeology from the University of Rome and another in conservation of archaeological materials at the Central Restoration Institute, Rome. In 1982 he founded the Centro di Conservazione Archeologica (CCA), a private company carrying out public commissions in the field of conservation of ancient monuments and archaeological sites. He has directed more than 50 projects and training courses in 14 countries. He is a Fellow of the IIC and vice president of the International Committee for the Conservation of Mosaics (ICCM). Dr. Nardi is a Kress Lecturer at the Archaeological Institute of America for 2010/2011.